Is it confusing trying to figure out what to feed your adult cat? 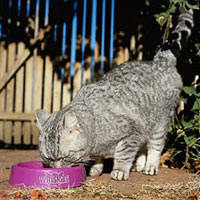 As strict carnivores, cats require food of animal origin and generally eat a variety of dry cat food. Here are some tips on how to feed your cat. The Association of American Feed Control Officials (AAFCO) is an organization that publishes regulations for nutritional adequacy of "complete and balanced" cat foods. Diets that fulfill the AAFCO regulations follow the national consensus recommendations for feline foods and will state on the label: "formulated to meet the AAFCO Cat Food Nutrient Profile for…(a given life stage). Underweight cats: Feed your cat 1-1/2 times the "usual" amount of food and make an appointment to see your veterinarian about your cat’s body condition. Consider switching to a food with higher protein and fat content. Fat or obese cats: Stop all treats except hairball medicines if needed. Increase exercise gradually over 2-3 weeks if not limited by a medical condition. If these measures fail, reduce the total daily food amount by 25 percent to 40 percent, switch to a low fat/high fiber diet, and call your veterinarian to discuss plans. Inquire about prescription-type reduction diets that can really be effective while providing balanced nutrition.